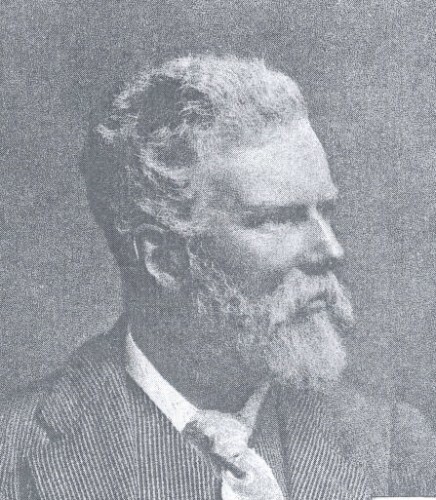 Bio Notes: Alfred Waterhouse was born at Aigburth, Liverpool on 19 July 1830 the son of Alfred Waterhouse Senior, a Quaker cotton broker and his wife Mary Brown, also a Quaker from Tottenham where their family was educated at the Friends School, Grove House. Although they still considered themselves Quakers, the family was received into the Church of England in 1864. Waterhouse was articled to the Quaker Richard Lane of Manchester from 1848 to 1853. In May of the latter year he embarked on an extensive study tour of France Northern Italy and Switzerland and opened his own office in Manchester on his return in 1854, mainly designing houses for Quaker family and friends. A further tour of Belgium, the Rhineland and Switzerland was made in 1857. In 1859 he achieved national fame when he won the Manchester Assize Court competition, and was admitted FRIBA in 1861. In 1865 he moved his practice to London, the catalyst being the commission for the New University Club. In 1868 he won the competition for Manchester Town Hall and in 1872 he was commissioned to build the National History Museum, the architect originally appointed Captain Francis Fowke having died. From 1877 Waterhouse was the architect to the Prudential Assurance Company, building three large branch offices in Scotland. By marriage he was also connected with the Younger brewing family, the practice's principal private client in Scotland. Except for Rouken Glen House, 1872-75 and the initial Younger commission, Arnsbrae, in 1885-86, Waterhouse's executed Scottish work is in the northern European early Renaissance idiom gradually adopted from 1881 onwards rather than the Romanesque and Gothic with which he had made his name. Waterhouse was elected ARA in 1878 and RA in 1888 and was President of the RIBA, 1888-1891. As in the case of Charles Barry Junior a decade earlier, his standing in the institute and his presidency resulted in him being assessor for several major Scottish competitions, Edinburgh Municipal Buildings, and Edinburgh Public Library, both 1887, Glasgow Art Gallery, 1891 and the Edinburgh North Bridge reconstruction, 1896. In 1891 Waterhouse took his son Paul into partnership although the latter claimed to have been in independent practice since 1887. Paul was born in Manchester on 29 October 1861 and educated at Eton. He was articled to his father in 1880, but broke his apprenticeship to go to Balliol, Oxford, from which he graduated MA in Classics. He returned to his father's office, 1884-1887, remaining as an assistant. During that period he won the RIBA Silver Medal in 1886 and followed in his father's footsteps in France, Belgium and Italy. He passed the qualifying exam in 1888, and was admitted ARIBA on 11 March 1889, his proposers being his father, Arthur Blomfield and George Aitchison. Admission to fellow followed very quickly on 11 March 1895, his proposers being his father, Sir William Emerson, Benjamin Ingelow and Ernest George. Alfred Waterhouse died at the country house he had built for himself in 1878, Yattendon, Berkshire, on 22 September 1905. Paul continued the practice and took his son Michael Theodore Waterhouse into partnership in 1919. Michael Theodore was born on 31 August 1888 and educated at Eton and Balliol like his father, and studied at both the Architectural Association and the Royal Academy Schools. He was admitted ARIBA in 1920. Paul Waterhouse died at Yattendon on 19 December 1924 when his last work in Scotland, the Younger Hall in St Andrews was only at the design stage. Michael continued the practice, taking Cedric Gurney Ripley into partnership in 1925. He was President of the RIBA in 1948-50 and died on 22 May 1968.